The purple line is the overlayed GPS track. As you can see from the loop at the right edge, I had to turn around – the road was closed by flooding. A difference between this approach in Google Earth to that of Google Maps is it is easier to share the information in the latter. People don’t need anything other than a web browser, and you do not need to send them a data file. I did see somewhere a GPS track overlay in Google Earth that rendered it as 3D – the height of the track related to speed. If I can find it and make it work, I’ll post back here. Now, all I need is to find a way in GE that I can measure the length of a GPS track and I’ll be extremely happy. It would be great to go for a walk, bike ride, or a drive; plugin your GPS data, and calculate how far exactly you had been and see data such as elapsed time between points. Then do this a number of times with different routes and you will get a very intuitive way of analysing best routes over a period of time. 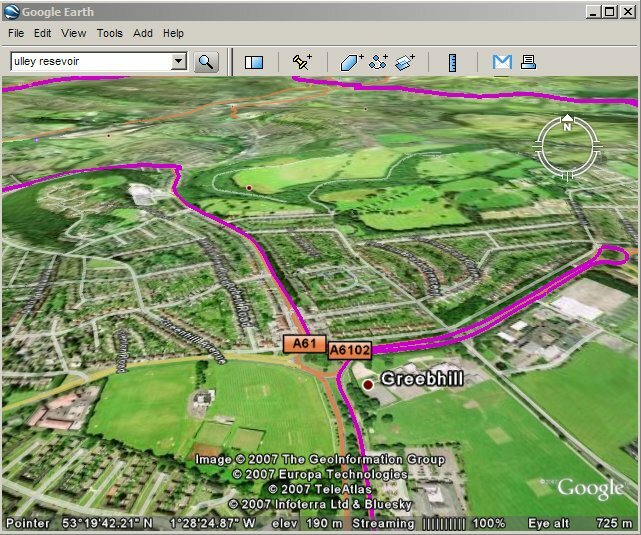 This entry was posted in Google Earth/Maps, GPS and tagged geotagging, tips, travel by Greg. Bookmark the permalink.